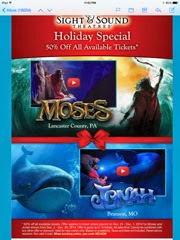 Special Savings Special Needs: Sight and Sound half price tickets! Sight and Sound half price tickets! I was excited to get the email for discounted tickets a week earlier than I expected ths year! Head to the website and use code SS14CM for half price Moses tickets to shows with availability.